Dear partners, You will receive today a new generation of SIM cards for the latest generation of smartphones that come in the near future on the market. Sort your SIM card please first not in their cards in hand and give it not out to customers.We will inform you shortly about how to proceed. The new iPhone is generally thought to be the first-and-only phone to use the Nano-SIM standard that Apple spearheaded and took through regulatory approval. 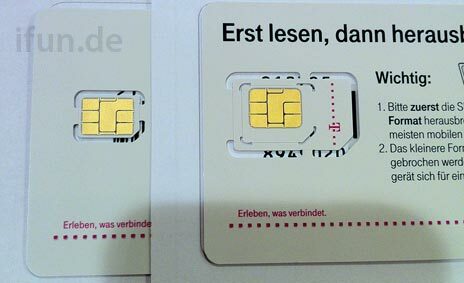 On the right, you can see the larger MicroSIM inside a normal SIM card. Numerous leaks of the new iPhone SIM card show a Nano-SIM.